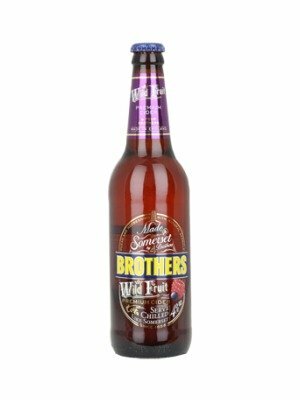 Brothers Wild Fruit Premium Cider is a popular Mixed Fruit Cider available from DrinkSupermarket.com in 50cl to buy online. Visit DrinkSupermarket.com for the best price for 50cl of Brothers Wild Fruit Premium Cider or compare prices on our other Mixed Fruit Cider products. Brothers Wild Fruit cider was created by festival goers mixing different Brothers flavours together. To satisfy the festival goes thirst for the mixed flavours, Brother made their own bottle and threw in some extra Raspberries, Blueberries and Blackberries. Enjoy chilled. Where to buy Brothers Wild Fruit Premium Cider ? Brothers Wild Fruit Premium Cider Supermarkets & Stockists. You can buy Brothers Wild Fruit Premium Cider online in most retailers and find it in the Mixed Fruit Cider aisle in supermarkets but we found the best deals online for Brothers Wild Fruit Premium Cider in DrinkSupermarket.com, and others. Compare the current price of Brothers Wild Fruit Premium Cider in 50cl size in the table of offers below. Simply click on the button to order Brothers Wild Fruit Premium Cider online now.